Oyster mushroom can be grown in enclosed spaces such as an empty house or an empty warehouse . To make oyster mushroom is also not difficult . Prepare drums , sawdust , rice bran and molasses and lime . Drums serve to seterilisasi . Ingredients to make oyster mushroom is about 25 kg of sawdust mixed with rice bran 2 kg and 1 liter drops . Once mixed , add 30 liters of water . mix well. After the wrap materials are mixed with plastic . Once wrapped all , to steam sterilization using drums . Mixture wrapped in plastic , steamed for approximately 8 hours . After boiling for 8 hours , refrigerate about 6 hours . Once cool, put oyster mushroom seeds . 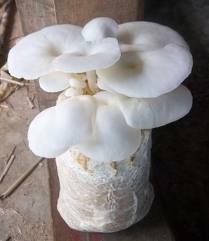 oyster mushroom seeds can be bought in oyster mushroom growers . A mixture of materials that already dibibit , placed in a room that is clean and not exposed to direct sunlight. In less than 2 months , the mushrooms can be harvested .